Urban Adonia: Bicycling, Above or Beyond Traffic Laws? Bicycling, Above or Beyond Traffic Laws? I ride in a cycle track on my morning commute. This narrow strip of pavement, separated by parked cars from a one way street with three lanes of traffic, gets very busy in the direction of downtown DC. Some people ride a little wobbly, on bikes that don't fit so great. Others ride really fast, zipping between the slower movers. Sometimes it's both at once, a wobbler who thinks traveling asfastaspossible is the right way to go, and they swing around me with their gym bags flailing. I wonder if these riders know much about the politics of bike infrastructure, and that it took a considerable amount of effort and years of pushing to get this little bollarded avenue in place. I prefer not to pass people in the cycle track, because I view it as a space that's been created precisely to subvert the expectation that everyone on a bike will ride fast. At least, that's the message assigned to cycle tracks in bike advocacy circles. But it's pretty difficult to affix one group's definition onto shared public spaces that thousands of individuals define for themselves in how they use them over and over. 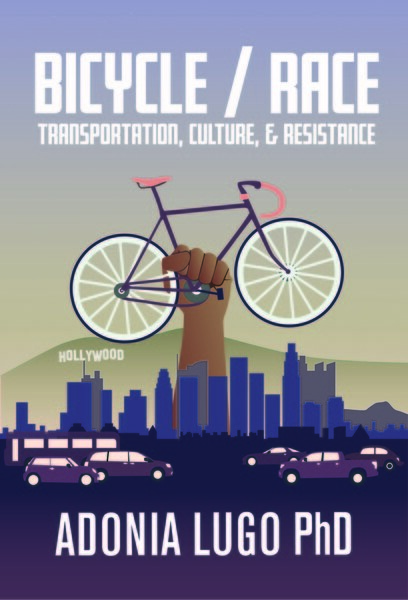 Much bike advocacy today aims to convince the public to act in certain ways in public streets through changing infrastructure and enforcing laws. I've got a different approach as a bike anthropologist, acknowledging that the bicycle has a particular capacity for disrupting time and space and thinking about how to take this into account. Riding a bicycle encourages a remarkable trick: a person on a bike finds fissures in time and space, gaps between red lights and green, moments when drivers haven't noticed they can proceed. It's pretty ingenious, you can squeeze through small gaps in space better than a larger car can, and you can squeeze through small gaps in time better than a slower pedestrian can. In the U.S. today, squeezing through these gaps often involves breaking the law. And from the standpoint of Follow The Rules So We Are Taken Seriously, it means biking "wrong" because lawful behavior is supposed to legitimize us as road users. But as an observer of streets, I can see that many people out and about are less interested in following traffic laws than they are in squeezing through time and space gaps. They legitimize themselves as road users by just going. If getting to work quickly will be aided by riding a bike through an intersection against a light, they go ahead and do it. Based on the fact that I'm often the lone cyclist waiting at a red light while others stream past me, I'm not even sure that the other pedalers are actively scoffing traffic laws. If they are, the hesitation while they deliberate whether to scoff known laws must be measured in microseconds. It's a pretty clear challenge to the goal I know many bike advocates share of making streets safer through following standardized rules. A lot of bike professional work is devoted to adapting European bike-specific rules and designs, so that the way we move around can fit into existing traffic engineering standards. The cycle track is the fullest realization of this vision, an increasingly standardized traffic control device specifically designed to regulate the flow of bicycle circulation. Beyond controlling behavior through street design, us bike people also try to convince folks that being lawful is a good idea. In some places I've lived, especially Portland, Oregon, bike users take it upon themselves to police the behavior of others on bikes. I remember when I was finding my groove as a bike commuter there in 2005, I would yell at bikers who blew through stop signs. The feeling of self righteousness was like a drug, pumping some more adrenalin into my veins. When I moved to Los Angeles, I developed a more flexible approach: I would stop if drivers were around, but I wasn't going to put my foot down at a stop sign if there was nobody there. I no longer found it appropriate to tell other people how to use the streets, considering the pressure we all faced from hostile drivers. But riding against red lights remained anathema. Here in DC, I'm starting to crack, feeling like a fool as I watch others exploit the time gaps I'm letting slip by. And then, this summer, a man driving a car with a suspended license struck my mother and her partner as they crossed a street lawfully, in a crosswalk, with a walk signal. They were in Newport Beach, California, along a stretch of the beautiful Orange County coastline where people driving cars hurt people walking and biking with a frequency that speaks volumes about how little consideration is normally offered to bodies outside of cars in my home region. So now when I stand at red lights astride my road bike and feel the breeze of other bike users passing through the empty intersections, I think bitterly about how the law did not protect my mother. She was behaving in accordance with street infrastructure and legal regulations when another person chose to ignore multiple laws and break her bones in four places. What does the law protect? What does using the infrastructure properly ensure? I don't have that feeling of self righteousness anymore to keep me smug while other people get home faster. When people on bikes take advantage of time gaps and cut off pedestrians, I'm troubled. To me, this is what it means to bike "wrong": to make oneself into a threat to other road users. If there's a person approaching me on foot, I don't think of the space that person is about to occupy as up for grabs. I'd like to see more bike people espouse an inclusive message about "right" ways to ride that acknowledge others' rights to occupy space, even if it's going to mean letting go of one moment's forward motion. I'd like to see bike people get past acting above the law, and focus on moving beyond it. I don't see a lot of value in fighting so hard to create special laws and infrastructure for people on bicycles to ignore, just like so many people do when driving cars. I want to legitimize the existing and future social reality of shared streets, both in our own habits while riding and in our advocacy work. But who knows, maybe I'll just start yelling at the bicyclists who cut pedestrians off. Old habits die hard.